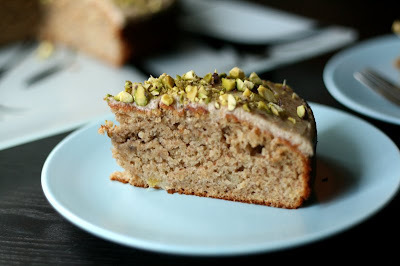 This banana cake is so moist and soft. It is not dense though, and retains a beautiful light texture. 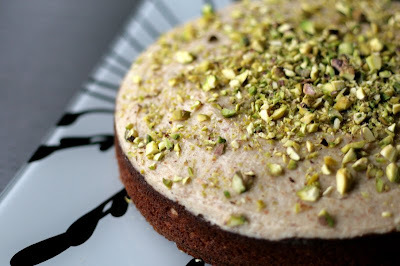 Honeyed mascarpone cheese frosting, with ground almonds mixed through; finishes the flavour wonderfully - but careful not to go too overboard with the mascarpone as it will become to sweet I think. 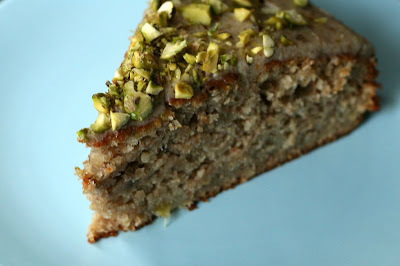 I added the pistachios to add some texture, but the flavour also compliment is and adds another dimension. Overall, I am very happy with this banana cake. We had it on Saturday afternoon with coffee while it was pouring down with rain outside. Makes it taste even better! Beat the butter with the brown sugar until smooth and creamy. Add the egg and continue to beat until smooth. Then beat through the mashed up banana; don't worry if there are some banana chunks in there. Combine the wholemeal flour, ground almonds & baking powder. 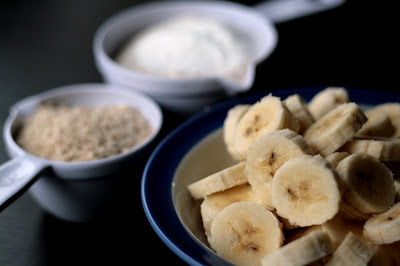 Fold through the banana mixture until smooth. Then fold through the milk until all smooth. Spoon mixture into a greased cake tin and bake at 170Celsius for around 40-45 minutes. Check it at the 30 minute mark cause you don't want to over cook this. The top should be nice and golden. For the frosting, simply whisk together all ingredients until nice and smooth. Add a bit more ground almonds to thicken it up if you like. 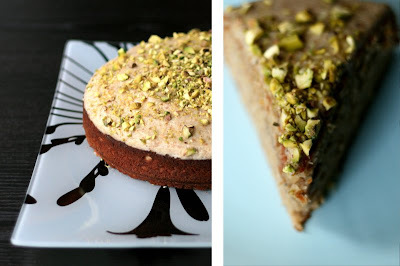 I am always impressed by how pistachios can make themselves at home in almost any dish, sweet or savory. Growing up, I only knew them as a snack food at the holidays, complete with the tell-tale red fingertips. So glad those days are behind me! This sounds and looks great!!! 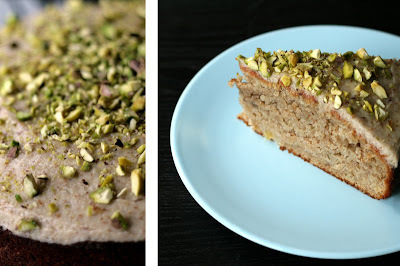 I love the healthy kick using wholemeal and almond flour! Yum! Jennifer - I try not to use white flour as much as possible; its got no nutritional value and basically turns to glue in your stomach! So yes, wholemeal is always my first choice. 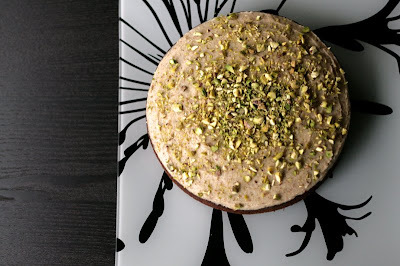 Yum - nice play on the almonds and pistachios! I'll need to modify a bit, but sounds delicious. But how do you do the Mascarpone frosting??!?! Erica - gluten free? 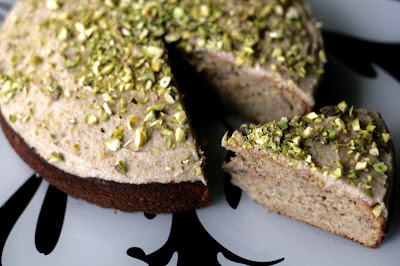 I would just use all almond flour, I was nearly going to but didn't have enough almonds. It won't be as fluffy but will be beautifully rich. Joaquin - Sorry! I'll update the post with the frosting! I don't usually use milk when i bake. How long would this cake last? 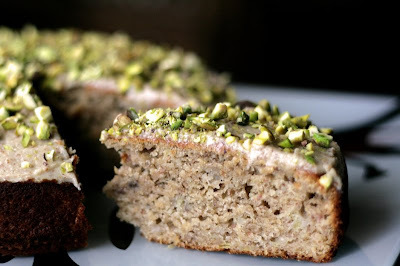 I am going to try it as I use bananas for banana bread all the time. Mascarpone frosting sounds yummy. It'd be great to help to promote your business. Dee - well it didn't last very long in my house! It was divided up and sent off to friends as well so was gone in 24hrs. But I think in the fridge a few days. Hi!! I love this recipe. Just a question, what's the size of the pan used in this recipe?